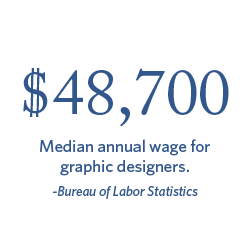 You've got an eye for design and are ready to take your skills to the next level. Regent's Bachelor of Fine Arts in Graphic Arts teaches you the technical foundations, industry-leading skills and design software needed for careers in graphic arts, marketing, advertising and media integration. Study the fundamentals of design, digital photography, illustration, drawing, web design, logo development, corporate branding and more—all from a Christian worldview. Explore art history along with the latest in design technologies. Develop a professional portfolio highlighting your skill mastery and artistic talents. Be mentored by award-winning faculty in Virginia Beach and online. Develop industry-standard materials for interactive media and multi-platform campaigns. Evaluate visual communication strategies based on data-driven outcomes and popular culture. Provides a critical look at the development of art and design styles, from pre-historic cave paintings through the middle ages. Provides a critical look at the development of art and design styles, from the Renaissance through to today’s top artists and designers. Prerequisite: ARTA 100. Provides a comprehensive introduction to the hardware systems, design applications and industry practice for graphic design. The lectures and class demonstrations cover the basic techniques and processes of graphic design. Basic fundamentals of professional practice, including: systems, processes, common documents; OSHA guidelines; legal issues pertinent to the creative professions; budgeting; project management: marketing will be introduced. Explores the possibilities of computer as an artist tool to create images and illustration in Adobe Illustrator. Students will develop concept and sketches, generate a number of expressive solutions, and explore illustration techniques with various styles or media, with an emphasis on computer art. Prerequisites: ARTA 100, ARTA 110, ARTA 121. Introduces basic knowledge and skills in Adobe Photoshop. Students learn the terminologies, concepts, methods and techniques in image manipulation. These skills will be used as a tool for analyzing and creating various images for design. Prerequisites: ARTA 110, ARTA 120, ARTA 121. Introduces the techniques for taking digital photography, editing and manipulating photos in Adobe Photoshop and Camera Raw. Focuses on photographic effects and techniques used as tools for analyzing and creating various images to be used in design. Addresses various areas of typography, from the history of typography, font attributes and categories, to the technical and artistic use of type as a means of communication. Skills in digital typography, type hierarchy and figurative typography will be developed. Prerequisite: ARTA 121. Addresses the creative solutions of layout composition and digital layout skills in Adobe InDesign. Grid theory, type and imagery in page layout, hierarchy and multi-page document creation explored. How to utilize principles and creative process to develop a concept from sketches to digital layout composition. Prerequisites: ARTA 110, ARTA 121. Explores the idea of the iconography in graphic design. Logos and other symbolic images are examined in historic and cultural contexts. Various types of logos explored. Emphasis will be on visually representing appropriate forms as graphic symbols. Prerequisite: ARTA 210. Basic understanding of web design concept, process and techniques. Introduces basic web design using HTML and CSS. Planning and designing effective web pages; implementing web pages by writing HTML and CSS code; enhancing web pages with appropriate design elements; and producing a functional, multi-page website. Prerequisite: ARTA 210. Investigates the current concepts, methods and technologies in the design of interactive media. The mechanics of 2-D animation with audio and interactivity will be explored. Prerequisite: ARTA 305. Building on the foundation skills of drawing, design, and color theory, it focuses on materials and methods while exploring a variety of subjects and pictorial strategies. Includes contemporary and historical work, as well as critical judgment and presentation. Prerequisites: ARTA 120 and ARTA 121. A further exploration of typography as a graphic design tool, with the focus on expressive and kinetic typography. Experimenting with typography from historic or contemporary viewpoints and artistic communication needs. Prerequisite: ARTA 210. Explores packaging design from marketing, graphics, and 3D design perspectives. Packages for a variety of products are analyzed. Logos, graphics, typography and color schemes are developed for individual products and related product lines. Development of functional and creative solutions to design projects and 3D mock-ups are required. Prerequisite: ARTA 300. In-depth study of drawing methods & techniques and development of personal style. Prerequisite: ARTA 201. Creation of original hand-drawn art using Digital hardware and software most particularly Photoshop. Prerequisite: ARTA 130. Delves deeper into web-related concepts, methods and technologies. Continues to develop planning, usability, content, site management, interactivity, design and production skills for web design. Advanced and dynamic web page design will be covered. Prerequisites: ARTA 305 and ARTA 315. Investigates the underlying principles of publication design, a mainstay in the study of graphic design, including hierarchy, grid, page layout, typography, sequence and pagination, and digital publishing. Explore concepts, technologies and practices in various areas of publication designs. Prerequisites: ARTA 210 and ARTA 220. Involves designing and implementing a corporate logo in a branding package which includes stationery, signage, advertising, packaging, web page and other miscellaneous items. Explores concepts of branding and relating them to corporate marketing. Research of many of the famous brands and their impact on us. Prerequisite: ARTA 300. Directs students to research and plan their own graphic design project through guided examination of some representative graphic design works and class discussion over various topics on art theory and criticism. Research, creative writing and concept development required at this stage. Prerequisites: ARTA 425 and ARTA 430. Continuation of Senior Project 1. Students must have successfully completed Senior Project 1 before taking this course. The course focuses on the project design process, production and final project delivery and presentation. Prerequisite: ARTA 486.